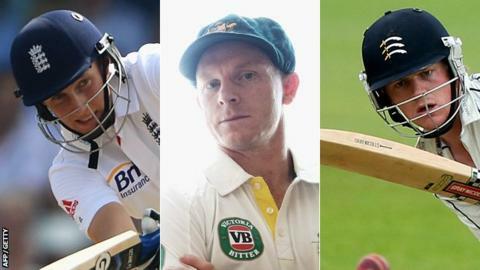 Joe Root should not open the batting for England, according to Australia batsman Chris Rogers. Rogers, 36, tipped Middlesex team-mate and opening partner Sam Robson as a better choice after his impressive winter with the England Lions. "Sam is going to be a very good international player," Middlesex captain Rogers told the Sunday Times. "I don't particularly think Joe Root's an opener. He plays spin well and he's better suited to the middle order." 17 & 15: Lions v Sri Lanka A, first unofficial "Test"
142: Lions v Sri Lanka A, second unofficial "Test"
0 & 147*: Lions v Sri Lanka A, third unofficial "Test"
Yorkshire's Root, 23, was dropped from the England Test side after struggling during the winter's 5-0 Ashes whitewash. Since scoring 180 in the second Ashes Test at Lord's last July, he averages only 25. Robson, 24, scored five centuries for the England Performance Programme and the Lions - England's second string side - on their winter tour of Australia and Sri Lanka. Rogers also said Middlesex pace bowler Steven Finn needs more time in county cricket away as he aims to win back his England place. Finn, 25, did not play a Test in Australia and was sent home early during the limited-overs series after coach Ashley Giles deemed him "unselectable". Concerns over Finn's action and confidence were partly allayed when he claimed six wickets in Middlesex's opening County Championship game at Sussex last week. Rogers said: "He's so young. There's so much time and he's just gone through a pretty tough period. It might be better for him just to settle in, play cricket and get some confidence and belief back."